When I was struggling in a certain area, I searched the Internet for resources and ideas to help me. I didn’t want to stay in the situation I was in. I wanted to overcome and conquer this sin with God’s help. I learned this method to avoiding temptation and tweaked it for my use. I hope it will help you as well. Write down on a piece of paper the temptations that you want to eliminate from your life. This confirms in your mind that you are serious about getting rid of these sinful habits. Put your list in your Bible or some place where you will see it often. Seeing it reminds you that this is your goal and you will be able to achieve that goal if you are reminded often. If you have a close friend that you trust, or even your Youth Pastor, ask if you can give them a copy of the list so they can pray for you and ask you regularly how you’re coming along. This is called “accountability” and it will help you to succeed. Memorize 1 Corinthians 10:13 There hath no temptation taken you but such as is common to man: but God [is] faithful, who will not suffer you to be tempted above that ye are able; but will with the temptation also make a way to escape, that ye may be able to bear [it]. So, when you’re being tempted, you’ll be able to remember this verse and you can quote it to God so He can provide that way of escape for you. Memorize more of God’s Word. Ps 119:11 says, “Thy word have I hid in mine heart, that I might not sin against thee.” It is God’s Word which will help you to stay out of trouble. Whenever a situation comes up that tempts you, you’ll be reminded of a Bible verse which will keep your mind on God rather than the temptation itself. Replace your temptations with righteous alternatives. For example, if you like to make fun of other girls, learn to say nice things about and to them instead of nasty things. If you like to read trashy books or watch trashy shows, replace them with Christian books and Godly shows. When you replace ungodly things in your life with good things, you eliminate temptation in this area. Ephesians 4:25-32 Wherefore putting away lying, speak every man truth with his neighbour: for we are members one of another. 26 Be ye angry, and sin not: let not the sun go down upon your wrath: 27 Neither give place to the devil. 28 Let him that stole steal no more: but rather let him labour, working with [his] hands the thing which is good, that he may have to give to him that needeth. 29 Let no corrupt communication proceed out of your mouth, but that which is good to the use of edifying, that it may minister grace unto the hearers. 30 And grieve not the holy Spirit of God, whereby ye are sealed unto the day of redemption. 31 Let all bitterness, and wrath, and anger, and clamour, and evil speaking, be put away from you, with all malice: 32 And be ye kind one to another, tenderhearted, forgiving one another, even as God for Christ’s sake hath forgiven you. Also, Colossians 3:5-14 says Mortify therefore your members which are upon the earth; fornication, uncleanness, inordinate affection, evil concupiscence, and covetousness, which is idolatry: 6 For which things’ sake the wrath of God cometh on the children of disobedience: 7 In the which ye also walked some time, when ye lived in them. 8 But now ye also put off all these; anger, wrath, malice, blasphemy, filthy communication out of your mouth. 9 Lie not one to another, seeing that ye have put off the old man with his deeds; 10 And have put on the new [man], which is renewed in knowledge after the image of him that created him: 11 Where there is neither Greek nor Jew, circumcision nor uncircumcision, Barbarian, Scythian, bond [nor] free: but Christ [is] all, and in all. 12 Put on therefore, as the elect of God, holy and beloved, bowels of mercies, kindness, humbleness of mind, meekness, longsuffering; 13 Forbearing one another, and forgiving one another, if any man have a quarrel against any: even as Christ forgave you, so also [do] ye. 14 And above all these things [put on] charity, which is the bond of perfectness. Stay away from the things that tempt you – that’s the best way to avoid temptation. The Bible tells us to flee from sin. James 4:7 Submit yourselves therefore to God. Resist the devil, and he will flee from you. Flee from the sins and follow after the things of God. 1 Timothy 6:11 But thou, O man of God, flee these things; and follow after righteousness, godliness, faith, love, patience, meekness. And 2 Timothy 2:22 Flee also youthful lusts: but follow righteousness, faith, charity, peace, with them that call on the Lord out of a pure heart. If you have a problem with cursing, stay away from those friends who curse. Make new friends if you have to. But make the effort! If you drink alcohol, then stay away from situations where alcohol will be served. Make sure that you pray. The Lord encourages us to pray so that we can avoid temptation. This is where I failed early on in my Christian walk. Prayer is so important. 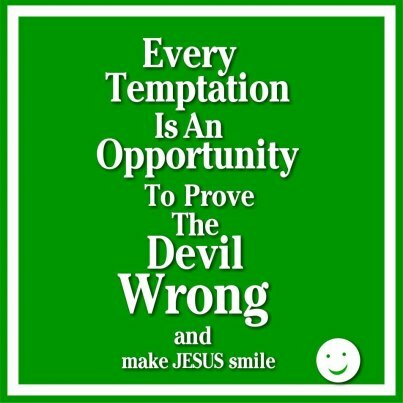 Luke 22:40 And when he was at the place, he said unto them, Pray that ye enter not into temptation. Study your Bible. For example, if your sin is being impatient with your parents, study about patience. Find verses dealing with patience and memorize a couple of them so you can easily pull them out of your memory when you’re tempted to yell at your Mom or Dad. If your sin is stealing or lying, then study about the consequences of that sin. Teen girl, you canovercome temptation. The Lord your God is faithful and He will always provide a way for you to escape temptation. But you have to take the first step of obedience when temptation comes knocking.